Knit up this cozy trio for three times the cuddling fun! 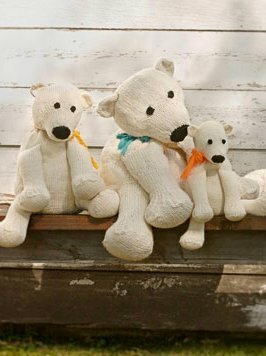 With three sizes and three different yarns, you're sure to find the bear that's just right! Susan B. Anderson Patterns - Woodland Fox and Tot Toppers Patterns - Fancy Ruffles are both similar patterns: baby accessory garment, for babies and children, and worsted (19-20 sts/4 in) yarn gauge. Hopefully our suggested yarn options for Talitha Scarf can help you come up with your next exciting new project idea! If you like Spud & Chloe Patterns, then you may be interested in the different ways we've used them. Visit our Baby and Birthday collections to see some ideas.